Serafina Press was founded in 2006 by Jennifer Docherty who also owns the Smokehouse Gallery in Eyemouth. Serafina specialises in art-driven children’s books which are mainly set in Scotland and Northumbria. Some of the books set in the Scottish Borders include “Bear in a Boat in the Borders”, “The Eyemouth Mermaid” and the “Pirate Kings of Eyemouth”. These books are already favourites in the Henderson family, as many of the authors and illustrators have attended the children’s festival of the Borders Book Festival which is held in Melrose each June. 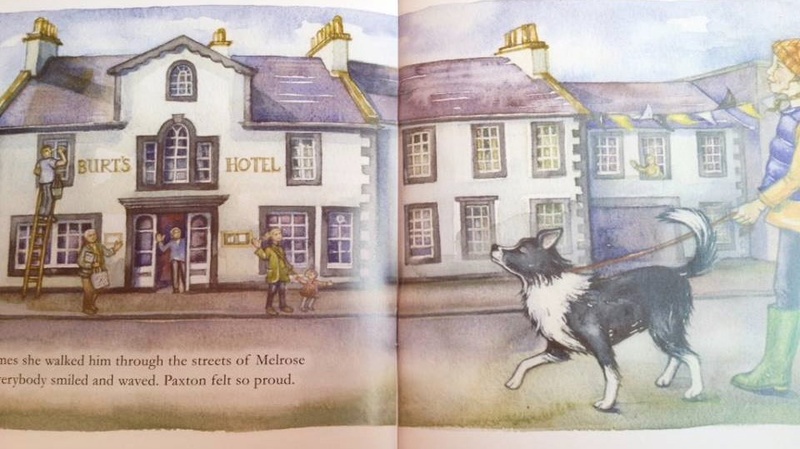 So “Paxton, the sheepdog who couldn’t…” is a welcome addition to this wonderful range of beautifully illustrated books, which although strictly for kids up to age eight, we know will be loved by adults too. This is the first book by local Selkirk author J.K. Fox and lovingly illustrated by Alexa Rutherford. It tells the story of sheepdog Paxton who is a working dog on a farm near Melrose. The only issue is that he’s afraid of sheep. We hope that later in the year, author J.K. Fox might come along and do a special reading in Burts, we will keep you posted, but it is likely to be at the end of the year. You can get a copy of the book from Masons of Melrose, just along from the Townhouse, or from Mainstreet Trading in St Boswells. And of course, we have a few copies ourselves, as we are so delighted and honoured to be featured in this book. We are of course hoping this will be the new Katie Morag and will bring lots of new visitors to Melrose and the Scottish Borders. A huge thank you to Serafina Press and J.K. Fox for including us with such a beautiful illustration of Burts Hotel.